Though winter tends to be a time when my skin needs the most TLC, summer time is when I use the most products. LOL. I think it's because more is exposed and thus I feel a need to constantly be exfoliating, moisturizing, hydrating, protecting, etc. 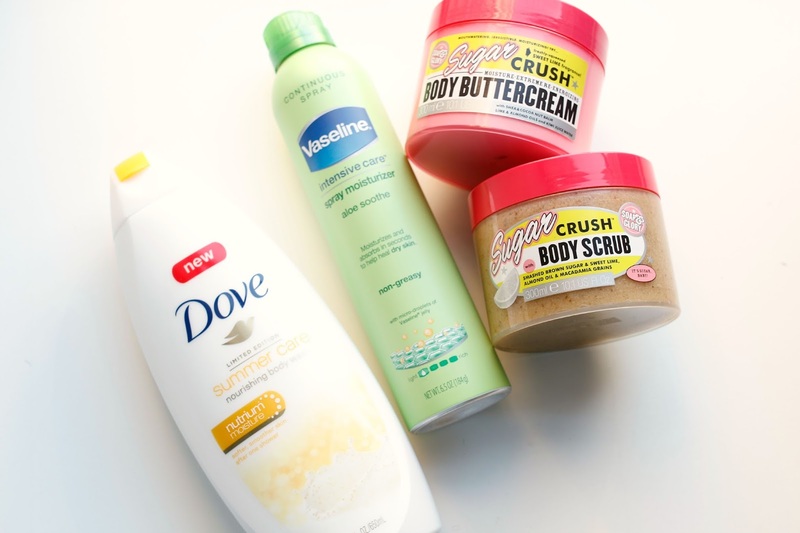 There are a ton of great budget beauty buys for the body and here are 4 that I've been testing and enjoying. 1. Soap & Glory Sugar Crush Body Buttercream - Would someone please explain to me why I have not yet tried this brand?!! Anyone?!! The only possible explanation is insanity, either that or I have been living under a rock all these years. Between the body products and the cleansing milk for the face, it didn't take a lot for me to get hooked. This body buttercream sounds incredibly decadent, and while it is, it's not too rich for the warm weather. It melts almost immediately on the skin and feels more like a light lotion/gel than a thick cream. Absolute heaven. And the scent is sweet with a hint of citrus. Your summer skin needs this. 2. Soap & Glory Sugar Crush Body Scrub - While I am not opposed to a salt scrub, I do tend to favor a sugar based one a bit more. Sugar has more healing properties and I find it makes my skin feel soft and soothed. This scrub is quite thick so it doesn't fall apart in my hands nor does it make an oily mess in the tub which is nice. It has a sweet lime scent that lingers a bit after the shower and leaves the skin with a hint of fragrance. 3. 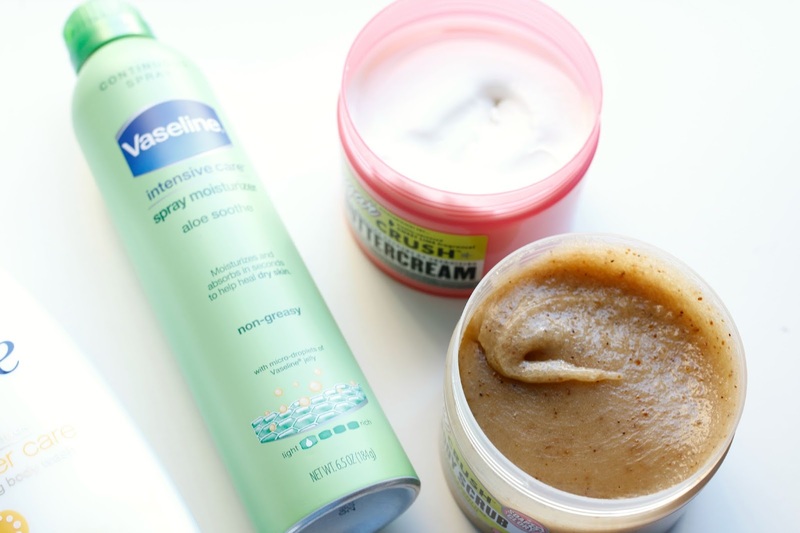 Vaseline Intensive Care Spray Moisturizer in Aloe Soothe - One of my favorite body moisturizers of all time is a spray application and I have yet to try another that I like as much. Until now. This one from Vaseline delivers a lightweight lotion easily with just one spray. This mist is a little narrow so I like to spray the area and then rub it in with my hands. I think what appealed to me the most about this lotion was how cooling and relaxing it made my skin feel. My legs tend to swell a lot in the summer (despite my attempts to eat as little salt as possible) and I have found that this works wonders on them after a long day. I spray it on my calves and then proceed to massage it all over my lower legs and feet and it has done wonders in helping my legs depuff. Though it is not necessarily designed to do that, I always like to find innovative ways to use the products I test. 4. Dove Body Wash Summer Care (swatch shown above) - Just a little tidbit about me - Dove Sensitive Skin Unscented Body Wash is my holy grail body wash. It has been for nearly 8+ years, and was recommended by my gynecologist believe it or not as a product that is gentle enough to use anywhere on the body without irritation. And once I tried it, I was hooked. So I was excited to give this new summer version from Dove a try especially because it had more exfoliating properties to it. As you can see from the above picture, the texture is a mix between a lotion and gel with little exfoliating beads mixed throughout. As I apply it, it melts right into the skin and leaves it feeling moisturized and refreshed. It's a nice change from my usual Dove standby and the lightweight texture is perfect for the warmer weather. Another reason why Dove has solidified a permanent spot in my shower.